Around 200 more children in Kirkcaldy than last year will need help to ensure they have a decent Christmas this year. The latest figures predicted by the Cottage Family Centre in Templehall show that the effects of Universal Credit have hit the town hard, with more than 1100 youngsters in desperate need of help. And the centre is appealing to the generous nature of Langtonians to support its Christmas appeal. It is asking for help to raise the remaining £11,000 needed to reach the £30,000 target to provide food for its families. In addition, the Cottage is providing families most in need with winter clothing including coats. At the moment 148 children are without the winter clothing and footwear they urgently need as the cold weather starts to bite and any help to fill the gap would be most appreciated. The Christmas support provided by the Cottage is for families with children under 16 living in Kirkcaldy and the surrounding area experiencing significant hardship or crisis. And every penny donated will be used to buy food and essentials including gas and electricity to allow them to heat their homes and cook their food. As well as monetary donations, the centre is looking for donations of non-perishable food, toiletries and toys and gifts for children 0-18 years. These can be dropped off at the Cottage or at one of its collection points. 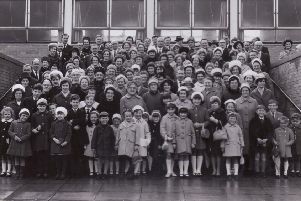 These are: Kirkcaldy – Toy Town, Mercat Shopping Centre; Bank of Scotland, Carberry Road; LT Beauty, Glen Albyn Drive; Fife College Campuses – St Brycedale, Halbeath, Glenrothes and Leven (reception areas); Haircourt, Harcourt Road; Anderson French Hair & Beauty, High Street; Philp Hall, Links Street; SDS options Fife, High Street. Also taking donations are: The Perfect Scoop, Main Road, East Wemyss, and Kingdom Housing Association, Glenrothes. When the Cottage first started its festive appeal in 2010 fewer than 100 children needed help. By 2015 this had increased 500. Last year figures rose to 955 with current estimates reckoning at least 1100 children will be in need of help this Christmas. Pauline Buchan, service manager, said: “This is going to be the most difficult Christmas imaginable. Rising poverty means that families in our towns do not have enough income to even provide the basic essentials. Gordon Brown, patron of the centre, added: “Kirkcaldy people are the most generous I know.